HGV ban for rat run road? Plans to ban HGVs from a road which angry residents say is being used as a short cut are being considered by Wigan Council. Proposals have been submitted to “de-prime” Winwick Lane in Lowton as those living there say trucks and large vehicles have turned the route into a rat run between the M6 and the East Lancs Road. Restrictions which could be considered include a weight limit banning vehicles of more than 7.5 tonnes from driving down Winwick Lane and signs along the M6 ordering northbound traffic to continue to Haydock island. The idea has received a mixed response, with residents hailing Wigan Council’s decision to consider the lorry ban but councillors and MPs in neighbouring areas fearing de-priming will lead to trucks finding other unsuitable routes instead. Dennis Eubank, deputy chair of Lane Head South Residents’ Group, said: “There’s issues with air pollution, with vibrations, with noise levels. It’s also a cumulative effect with all the other vehicles because there are 15,000 vehicle movements at Lane Head per day. “At peak times there’s queuing traffic all the way up to the end at Newton Road and you can be sat there for 20 minutes. The residents’ group will meet with representatives from the local authorities, police and HIghways England, with Leigh MP Andy Burnham also expected to attend. However, the idea looks set to encounter considerable opposition outside the borough, with the potential ban on HGVs using Winwick Road causing alarm in the village of Croft over the border in Warrington. 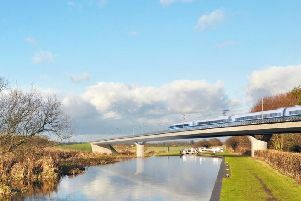 Warrington North MP Helen Jones and two councillors representing the Croft and Culcheth and Glazebury wards spoke to a local magazine and said they were deeply concerned about the idea. They fear lorries will still leave the M6 at junction 22 but will travel through the quiet village instead, with one councillor describing the proposal as a recipe for “traffic chaos”. Mr Eubank said he was not convinced by all the arguments from nearby communities but also wanted to work with them on an ideal solution rather than simply shift the problem from one place to another. He said: “I think they are doing a bit of scaremongering, to be honest. We don’t think there are going to be that many vehicles actually accessing the road which goes through Croft. Kevin Hargreaves, traffic manager at Wigan Council, said: “Winwick Lane has long been an issue campaigners have been calling for action on to stop HGV vehicles using the road as a link to the A580 East Lancs Road and Leigh from the M6 at junction 22. “We feel the road’s environment does not lend itself to a main route. This is taking into account the alternative route from junction 22 – A49 Winwick Link Road, which is a dual carriageway, is also not a primary route. If the road were to be de-primed it would mean motorists would instead be directed on motorway and local signage to junction 23 and the A580 cutting out travelling past residents homes on a daily basis. It would also mean that the road would not be used as a link on sat-nav programmes for those drivers unfamiliar with the area.